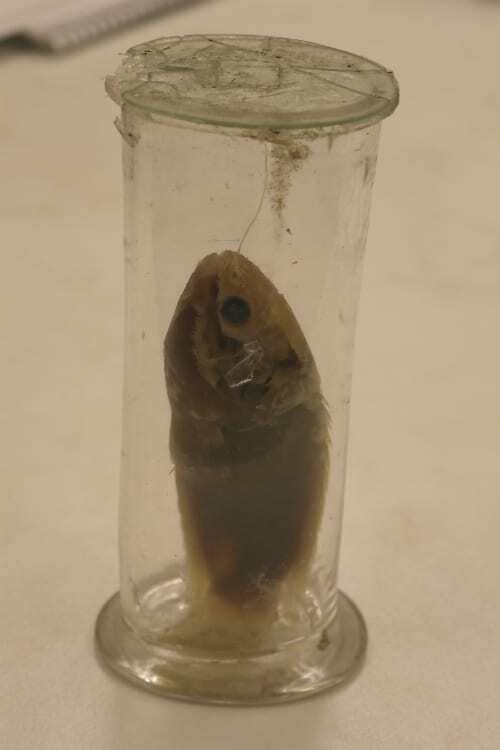 Our specimens have been preserved in a variety of fluids over the centuries. However, one of the most common preservatives is alcohol. In concentrations of 70%-80% alcohol, the fluid keeps the specimen from decomposing and will even allow for DNA extraction. Issues arise because alcohol evaporates very quickly when exposed to air and very often the seals on the specimen jar lids are not air-tight. If this is the case, as the alcohol evaporates, the concentration of alcohol in the fluid will decrease (alcohol evaporates more readily than the water it is in solution with). Alcohol concentrations lower than 65% can encourage mould growth on the specimen and can cause the specimen to start to decompose. If the alcohol evaporates fully then the specimen will dry out, potentially damaging the specimen for future use. All of these situations are certainly not ideal for our collections! More can be read on fluid specimen conservation here. The fluid is slowly evaporating and needs topping up. With the help of freelance conservator Lucie Graham, this year we are working through conserving all the fluid specimens that were assigned a condition category of ‘poor’ and ‘unacceptable’. 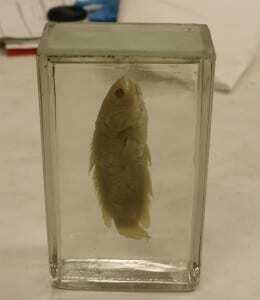 These categories represent specimens that are in dire need of conservation or else they will potentially be unsavable. Very often this means that the fluid in the jar has nearly evaporated or the specimen has already started to grow mould. Because the evaporation of alcohol can cause disastrous effects for fluid preserved specimens, it is very important to maintain a regular regime of checking and topping up the fluid levels in the collections. In order to top up or change the fluid in a jar, we first need to know the current alcohol concentration of the fluid. We do this by taking a small sample from the jar and testing it with a digital density meter for fluid. Once we know the alcohol concentration, we can then calculate the appropriate concentration of new fluid to add to the jar in order to achieve 80% alcohol. If the alcohol is nearly evaporated, then we need to put the specimen slowly through stages of 20% to 80% alcohol. If we were to put it straight back into a high alcohol concentration it could damage the specimen, as the change would come as too much of a “shock” – we have to slowly increase the strength of the solution. 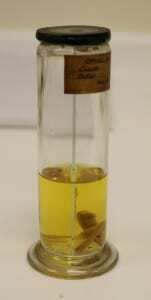 Once the alcohol concentrations are correct, the jar lids are sealed properly and the specimens should remain happy in their jars for many years. This work is scheduled to continue into 2017. We’ll be posting pictures of our progress over the the Grant Museum’s Twitter account. Fluid changed and specimens re-attached to the back plate. *We appreciate that not everyone likes the term “Pickle” for specimens preserved in fluid, but that’s been discussed elsewhere on this blog.